U.S. Senator Bob Casey knows that public service is a privilege and that he was elected to fight for Pennsylvania priorities and Pennsylvania values. He is working to foster financial security for American families, protect our children and invest in their futures and ensure safety at home and respect abroad. Senator Casey has made it his top priority to work to help create and incentivize the creation of family sustaining jobs and to help workers who lost their jobs through no fault of their own. As a member of the Joint Economic Committee, Senator Casey will continue this work while providing Pennsylvania with a stronger voice on job creation and economic policy. Senator Casey has voted to provide billions for tax cuts to encourage businesses to hire workers and he voted for legislation that provided tens of billions in capital for small businesses to expand their operations. And he has been a strong critic of unfair trade policies that put American manufacturing at a disadvantage. He has repeatedly pushed for the U.S. government to take stronger action against China in response to the undervaluing of its currency and other policies that result in American job loss. He also voted for legislation to eliminate tax incentives corporations receive to send U.S. jobs overseas. Shortly after entering the Senate in 2007, Senator Casey was one of the first senators to call for a fast response to the mortgage crisis that was sweeping the country and that would contribute to the global financial meltdown. He helped secure funding for programs to keep people in their homes and to protect against further declines in property value. Bob Casey is striving to ensure that the lives of our children can and will be better than our own lives. Senator Casey is a nationally recognized advocate for children. He has introduced two landmark bills to increase access to early childhood education and reverse the chronic underfunding of child care. He was a strong supporter of the law that expanded the Children’s Health Insurance Program which was signed into law in February 2009 to provide health care coverage to more than 14 million American children. During debate on the new health care law, Senator Casey helped to include a number of provisions to protect and improve health care for children. Senator Casey has been recognized with numerous awards for his work benefiting children including the Champion for Children Award from First Focus, Children’s Champion Award from the Children’s Hospital of Philadelphia and the Delaware Valley Association for the Education of Young Children (DVAEYC) Champion for Young Children Award. Senator Casey is the Co-Chair of the Weapons of Mass Destruction Terrorism Caucus and a member of the National Security Working Group. He is a leader in promoting nuclear security and combating the threat posed by terrorists obtaining nuclear material. To protect our troops in Afghanistan, Senator Casey has been the Senate’s leader to increase international pressure to stop the flow of ammonium nitrate, a prime component in IEDs that have killed or wounded thousands of troops and civilians. Senator Casey is also working with the Department of Defense and State Department to make sure they have the tools they need to stop the IED assembly line. To increase pressure on Iran, Senator Casey introduced the bipartisan Iran Sanctions Enabling Act, which would authorize the divestment of public pension money from companies doing business in Iran’s oil and natural gas sector. Senator Casey also cosponsored the Iran Refined Petroleum Sanctions Act to strengthen the President’s ability to impose sanctions on companies that help Iran import or develop refined petroleum. Both measures are now law. After a soldier from Pennsylvania was electrocuted in Iraq while taking a shower, Senator Casey pressured the Department of Defense and KBR to provide answers to his family. Because of this pressure and the work of the soldier’s courageous mother, safety inspections were increased in Iraq and Afghanistan and KBR was ordered to repay bonuses it had received for work done in Iraq. Senator Casey also helped pass an amendment to hold contractors accountable for the safety of their employees and U.S. service members overseas. In addition to his strong support for food stamps and other nutritional program in the Farm Bill, Senator Casey has been a strong advocate for increased demand during this economic downturn. When natural gas drilling began in the Marcellus Shale, Senator Casey was one of the first elected officials to demand that corporate profits are not put ahead of safe drinking water for our children and our families. He introduced legislation to require the disclosure of chemicals pumped into the ground and called for greater regulation to protect Pennsylvanians. He has also introduced legislation to improve emergency response at wells to protect workers and local communities and to prepare Pennsylvania workers for jobs in this new industry rather than ship in workers from out-of-state. In eight years as Pennsylvania Auditor General and two years as State Treasurer, Bob Casey compiled a record that focused on making government more accountable and responsive to the needs of Pennsylvanians. He has been a fiscal watchdog who made nursing homes safer, child care more affordable and government more accountable. He led the fight to reform Megan’s Law to better protect Pennsylvania communities and children. Casey serves on five Senate committees: Finance; Health, Education, Labor and Pensions; Agriculture, Nutrition, and Forestry; the Special Committee on Aging and the Joint Economic Committee. 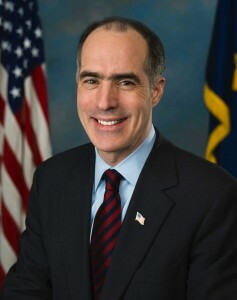 Born and raised in Scranton, Pennsylvania, Bob Casey, 53, graduated from The College of the Holy Cross in 1982 and spent the following year teaching fifth grade and coaching eighth grade basketball in inner city Philadelphia for the Jesuit Volunteer Corps. He received his law degree from Catholic University in 1988 and entered the practice of law in Scranton.